The Nasa Marine AIS radar is the first stand alone AIS receiver / plotter specifically designed for the leisure boat market. 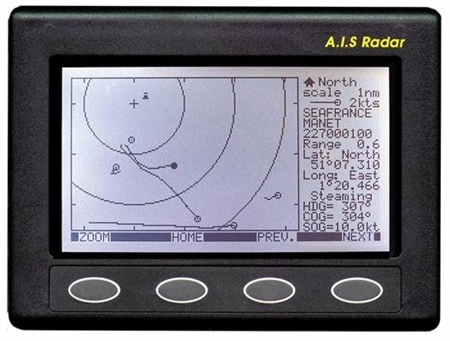 The display, with ranges of 1,2,4,8,16 and 32 nautical miles shows AIS carrying vessels in a format normally associated with conventional radar. A trail of previous positions clearly chows the relative track of all the targets on the screen. A box to the right of the screen displays the speed over the ground, the vessel name, mmsi number and the latidude and longitude of any target selected by the user. The compact unit has a white backlit LCD display, operates from 12 volts and consumes little power.